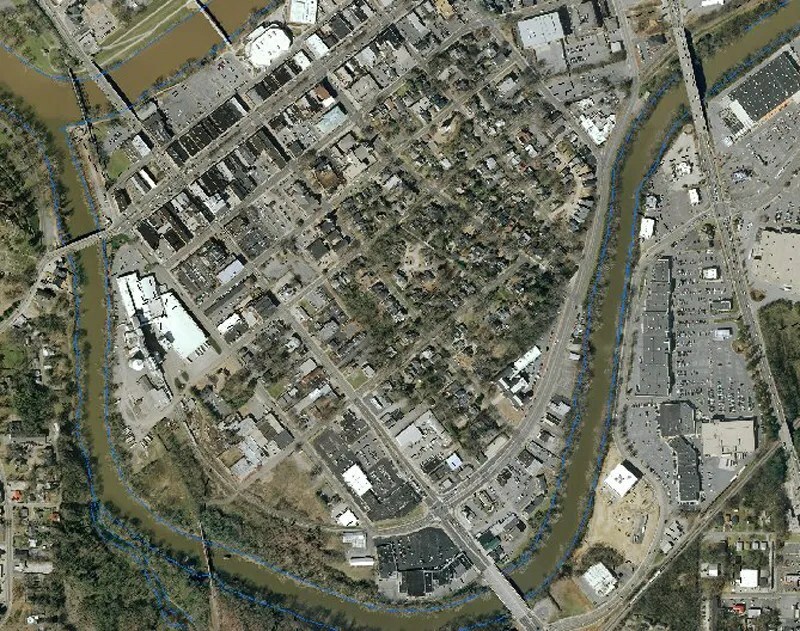 I posted some time back that I’m located in about an “urban” setting as one can have in a town of 40 – 50 thousand. Now, from time to time we have had raccoons, possums and foxes pass through. 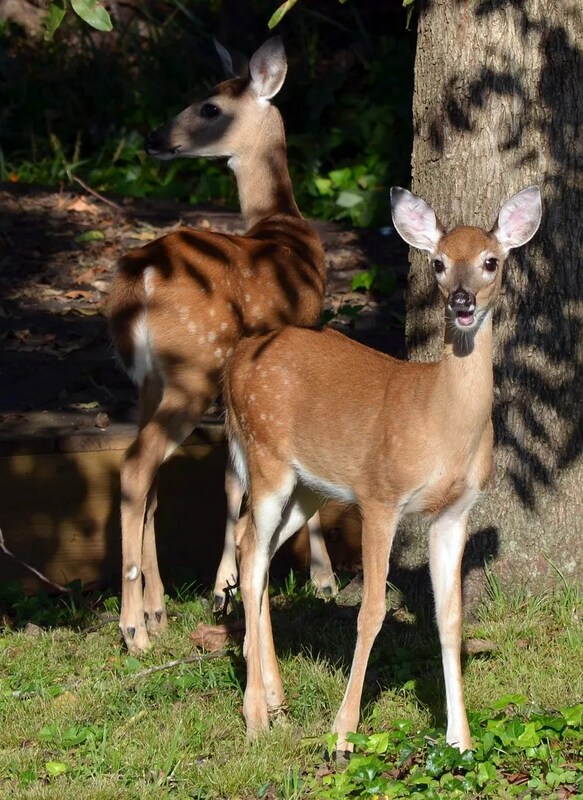 A couple months back, a doe and two fawns moved in… the doe has apparently moved on but the rapidly maturing fawns stayed behind and seem to be planning to call this “home”. They don’t seem to be particularly nocturnal anymore (they were when mom was around) and for the last couple of days have been down next to us in the morning. 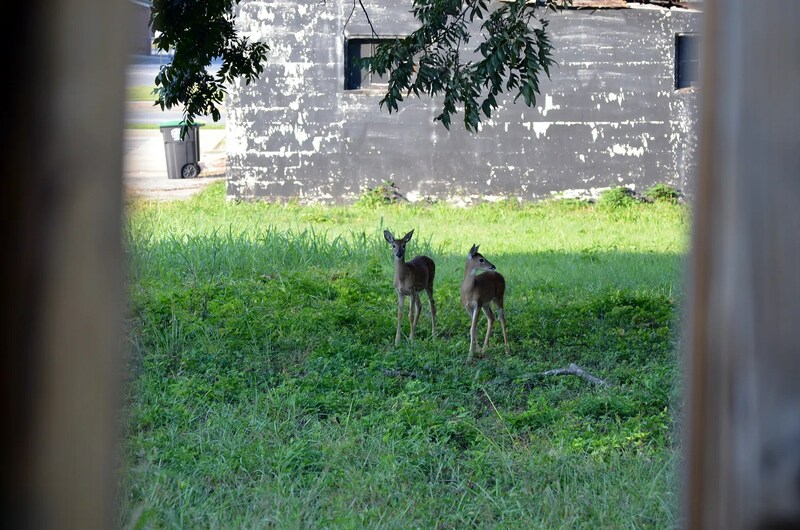 As I pulled the last of the tomato plants this morning, i had the back gate open and they seemed to be waiting for me to go in so they could come in a graze a bit…. 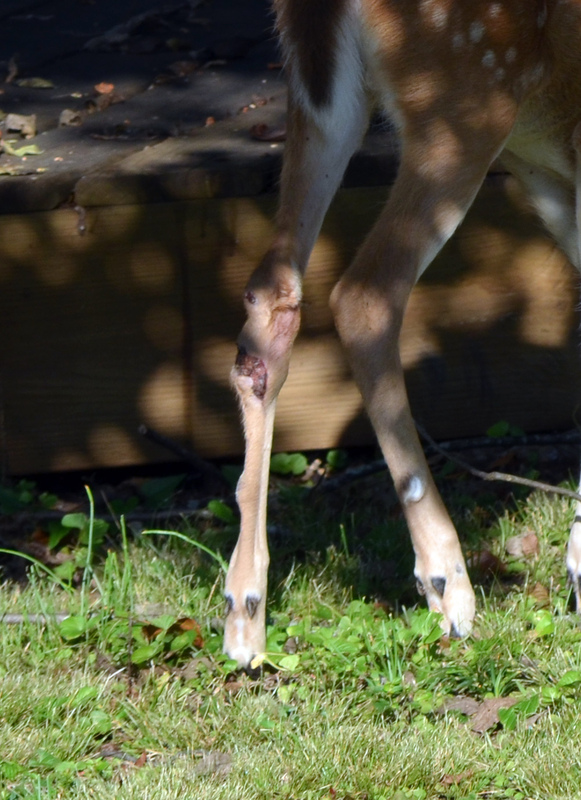 Edited to add thumbnail of damaged leg; if you want to see it click it for a larger view. My guess is a large dog has this one by the back leg a few weeks ago before he managed to free himself. He seems no worse for the wear though. Okay, how long will you hold out before you let them in for some lettuce? Just look at those faces! They are welcome to eat all of the clover they want over in the area they were standing but I don’t think I’ll invite them in…. It seems that more and more wild creatures are having to forage in urban and suburban environments. It’s sad that so much of their natural habitat is being eaten up by humans. When I worked at a police department people would regularly call in with complaints about wildlife and in many cases I had to explain that the animals were here first, so it’s not unusual to see them… in other words, we need to share the land. Yes- I agree. We even had a black bear on the “peninsula” above about 2 months ago. 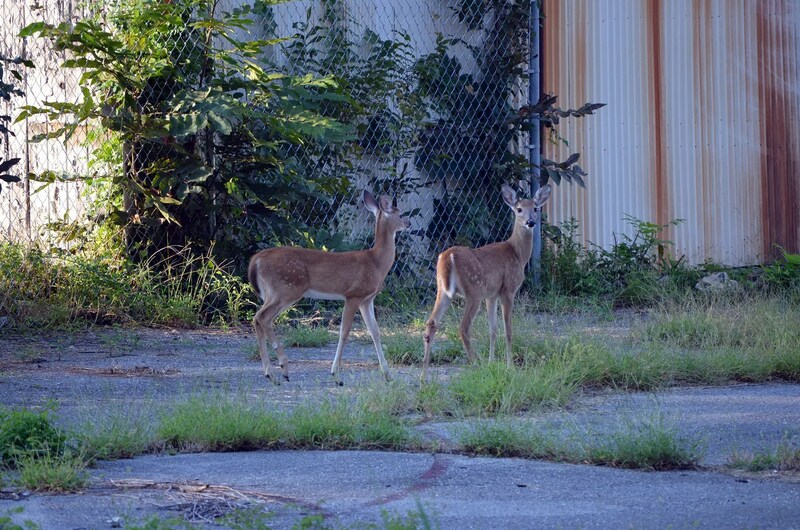 I am afraid for what their ultimate fate will be as the whitetail deer population in Georgia has recovered from almost nothing in the 1970s to what biologists consider over-population now. There is a lot of traffic downtown (the road behind them in the middle picture has 22,000 cars pass per day and claims a stray dog or feral car regularly (like every week or two). On the these had a bad injury to his back left leg at the knee that seems to have mostly healed now and maybe that is what immobilized him here for a while. I would be more confident of their long term survival if they move one in a week or two as they have almost lost all of their fawn spots now. Not so cute after they eat your entire garden down to dirt! Throw the dirty beggars out before they tell their friends of your beautiful all night free salad bar!!! They do have cute faces tho. LOL I knew eventually a suburban or rural gardener would appear to let this reality based view be voiced. These guys have already cleaned out many flower beds in the neighborhood but for now have not found a way over my fences. They are still too small to clear them and I’m hoping they relocate themselves before they figure out a way in….. They WILL find a way in…be afraid, be very afraid! Cute faces tho! Any higher and it would have ruined the roast! I’m going to tell your baby sister and your wife you said that. you’re the Hunter. I just show up at dinnertime.